Did you know Sunrock has the only pure trap rock quarry that is rail-served from Manassas, VA all the way to the Gulf of Mexico? Our Butner, NC quarry mines this extremely durable construction material for use in railroad ballasts, floor tiles, industrial insulation, concrete and asphalt aggregate and more. Trap rock is a type of basalt rock that is crushed and used in several different construction applications. 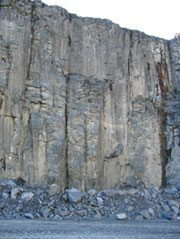 Basalt is dark, dense, fine-grained igneous rock formed from solidified lava in the earth’s crust. Trap rock is among the hardest forms of rock in the U.S. 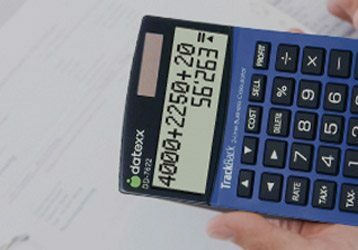 In fact, according to Moh’s scale, which measures the hardness of aggregates, trap rock is ranked 8 – 9 and categorized as “critically hard.” In addition to trap rock’s natural firmness, it also has a high modulus of elasticity, a measure of a rock’s ability to bend, instead of breaking, when under pressure. Thus, trap rock is considered extremely durable and can withstand even the toughest weather conditions. Thanks to its hardness and durability, trap rock has become a preferred aggregate for builders in heavy construction applications and other jobs with specific long-lasting, temperature-resistant requirements. Our trap rock is approved for use in NCDOT concrete paving, most recently for a 20 mile stretch of I-85. Because of its high modulus of elasticity, trap rock is ideal for high strength concrete applications. Butner trap rock has been used in concrete to reach strengths in excess of 15,000 psi. 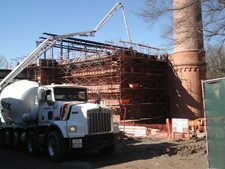 This type of high strength concrete is often used in massive, high use building structures such as commercial parking decks. Trap rock is also naturally fire resistant, with a measured melting point of about 1450° C. This makes it ideal for high-temperature concrete applications; it has even been used in nuclear power plants. Sunrock materials were recently used in the radiology department of Raleigh’s Rex Wellness Center, where our dense trap rock aggregate added radiation protection in the form of 5-ft. thick concrete walls. Due to the distinctive colors of our stone, Sunrock’s trap rock became the desired aggregate for exposed concrete at Duke University’s campus in Durham, NC. Duke was built in 1892 and follows strict construction requirements to maintain the traditional, natural beauty of the campus known to its students as “Gothic Wonderland.” Our trap rock is listed in Duke’s specifications for all outdoor exposed concrete applications, including sidewalks, driveways and pavement. 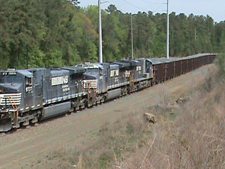 Norfolk Southern uses our trap rock as railroad ballast. Railroad ballast is crushed rock carefully laid between railroad ties, forming a trackbed. Railway engineers understand the importance of choosing the correct aggregate for this application — it must be durable and strong for rail stability, able to accommodate water drainage and prevent the cultivation of vegetation. With the help of our efficient load-out system, Sunrock provides railroad ballast for Norfolk Southern. 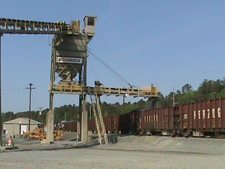 Norfolk Southern Railroad runs along the border of our Butner quarry, allowing our stone to be transported anywhere in the eastern U.S. Sunrock’s sophisticated, efficient ballast load-out system makes delivery fast and easy. View the above video to see our rail load out system at work.